Grilled Chicken Satay Skewers with crunchy peanut butter sauce, a fantastic appetizer that will be the star of any party. Absolutely flavourful and tasty, super easy to make, these skewers are the best of the grilling season. 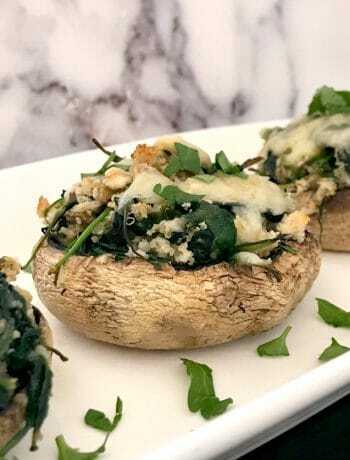 They can also be easily made on a grilling pan to be enjoyed all year around. I can’t really say that l’m a big fan of peanut butter, l may have it with a few slices of toast occasionally, but don’t really miss it otherwise. Same with roasted peanuts, l like the salty ones, and wouldn’t say no to having some from time to time. But, surprisingly, l loved these chicken satay skewers, it’s a wonderful combination of flavours, that l might otherwise find at least weird.But it works so well, and the chicken is lovely and tender. 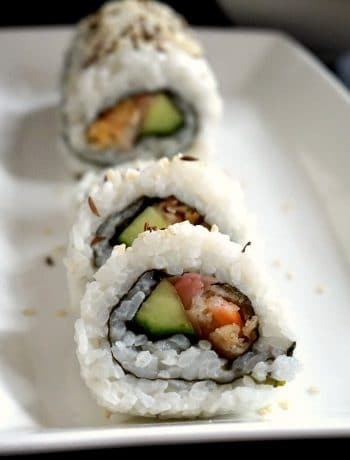 You know me already, l do like Asian flavours, and to me that is ginger, garlic and soy sauce, as being the main ingredients to any beautiful dish. There are, of course, other sauces too, but the soy sauce can’t really miss. I always have some soy sauce in my kitchen cupboard, it works well with so many dishes, not just the Asian ones. 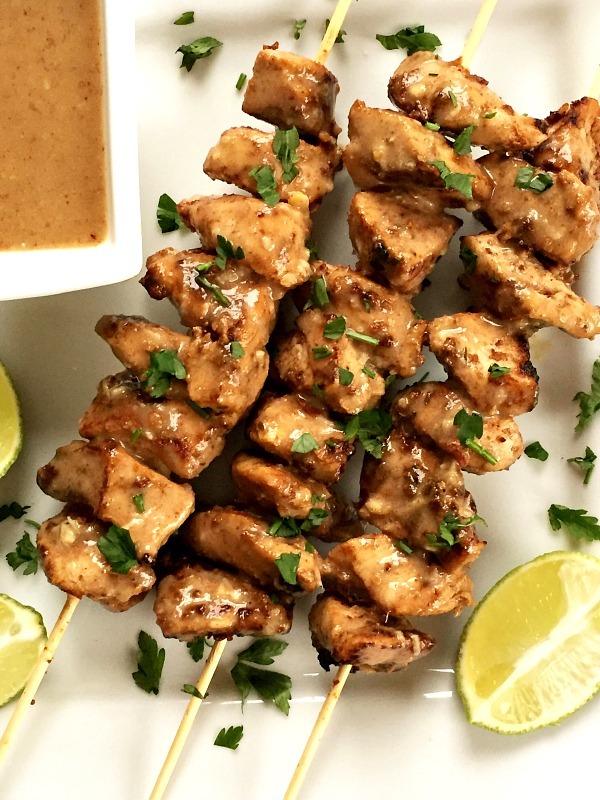 How do you make the marinade for the grilled chicken satay skewers? 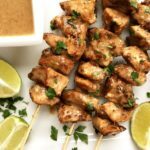 Chicken satay is a wonderfully flavoured chicken recipe, and the secret to the best satay is the marinade. One tip here is to refrigerate the coated chicken pieces for at least 2 hours so that the chicken can soak up all those amazing flavours. Making the marinade is super easy: just combine the peanut butter with soy sauce, garlic, ginger, honey and sesame oil, and coat the chicken breast pieces well. If you don’t like crunchy peanut butter, the smooth one is absolutely fine. Again, I opted for the crunchy peanut butter, although you can use the smooth peanut butter, for a more delicate texture, but l think it’s pretty interesting and brings that something different to these chicken satay skewers. And some gorgeous chicken satay skewers need some nice dipping sauce. The very best sauce is this amazing peanut butter sauce that just hits the spot. The lime juice contrasts beautifully with the sweetness coming from the honey, I highly recommend it for a bit of sharpness and a lovely citrussy kick. The cornstarch thickens the sauce nicely, otherwise it would be too runny. You can use regular flour if you don’t have corn starch, but only used half the amount in that case. You don’t need to wait for summer to have a bbq party, make your own chicken satay in any season, a grill pan is all you need. I know, it’s not the same without that smokey flavour, but nevermind. Alternatively, bake them in the oven, the result will be as impressive. If you fancy something different, how about these amazing BBQ Chicken Skewers? 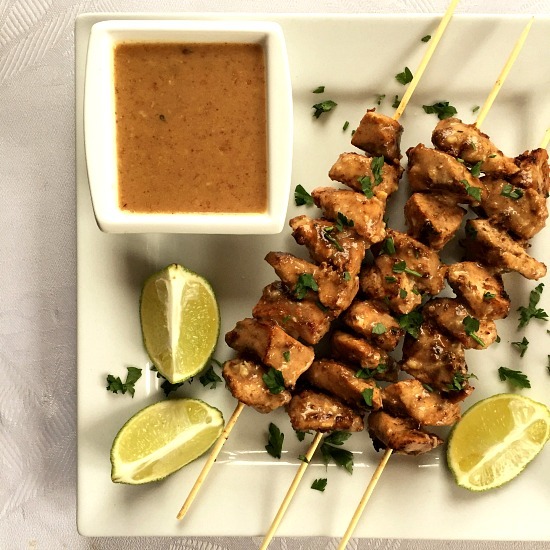 If you’ve liked my CHICKEN SATAY SKEWERS WITH PEANUT BUTTER SAUCE or any other recipe on the blog then don’t forget to rate the recipe and let me know how you got on in the comments below, I love hearing from you! You can also FOLLOW ME on FACEBOOK, and PINTEREST to see more delicious food and what I’m getting up to. 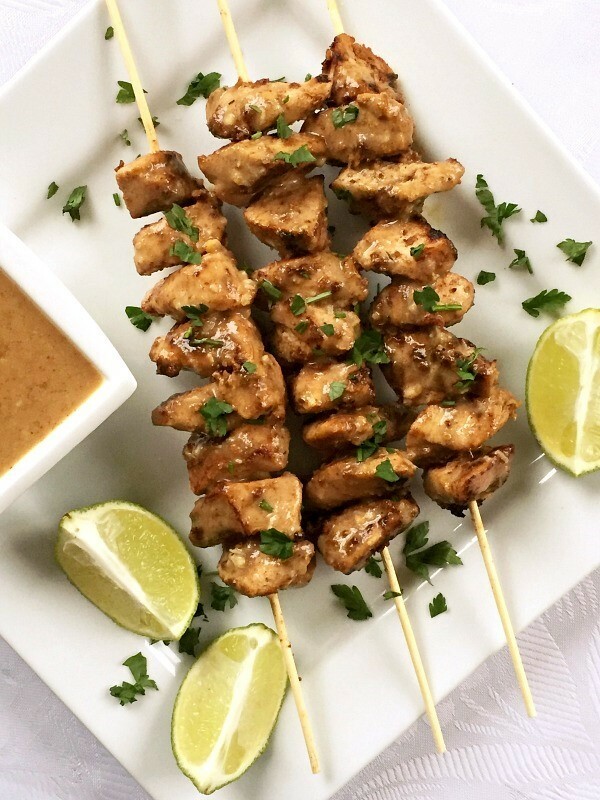 Grilled Chicken Satay Skewers with crunchy peanut butter sauce make a perfect dish for any party. 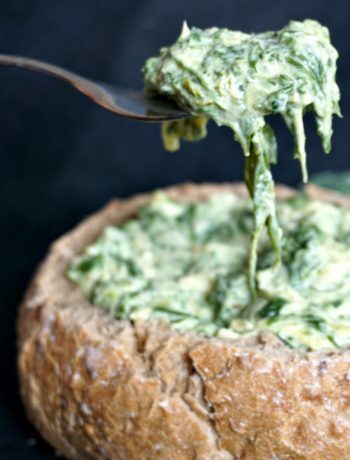 Serve them as an appetizer or even as a main dish together with a fresh green salad, there will be no leftovers, that's for sure. To make the marinade, combine all ingredients (minus the parsley), coat the chicken breast well, and refrigerate for at least 2 hours. Bring the grill pan to a medium to high heat, place the chicken and grill on both sides for about 3-4 minutes, until cooked through. Arrange the chicken pieces on a few skewers. To make the sauce, pour the chicken stock in a pan over a medium heat, add the ginger, garlic, peanut butter, soy sauce and honey and give it a good stir. In a small bowl, combine the cornflour with 2 tablespoons of the stock, mix well, then add to the pan. Stir well until the sauce thickens slightly, add the lime juice, give it a good mix, then remove from the heat. Place the chicken skewers on a serving plate, brush the chicken with the peanut sauce, and retain the rest of the sauce for dipping. Garnish with freshly chopped parsley (or coriander). A great idea for the holiday season parties! Thank you! I hope you’ll like them! ? This is a awsome recipe, I love chicken meat and I love chicken skewers but in this combination is really fantastic! Thank you, Florentina, for your kind comment,l’m glad you like it! Multumesc frumos! ?